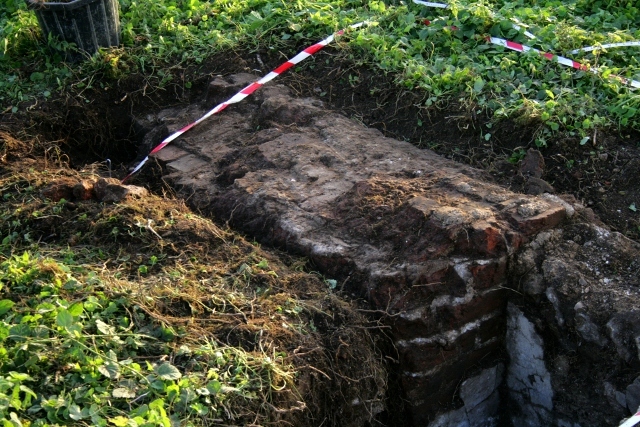 Looking S at chimney base on E side of cottage. Some real progress was made with our dig, despite no new finds, or features. We also had a very welcome visit from John Funnel (in charge of digging with Brighton & Hove Archaeological Society)! 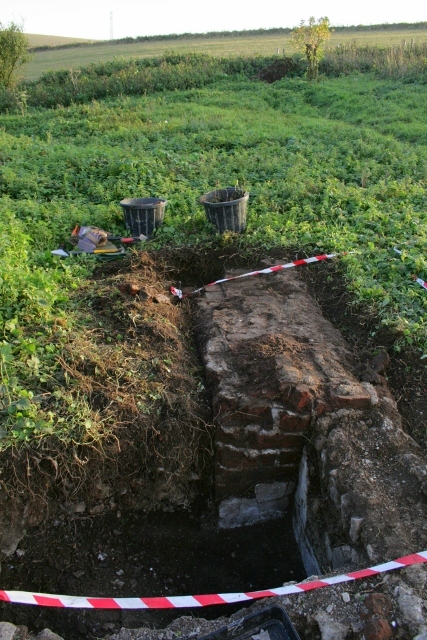 The day was spent extending Friday’s trench by an extra 2x2m, to completely take in, further excavate and clean up the surviving remains of the chimney and its immediate context. It was a solidly built structure using smaller bricks than was generally used elsewhere. 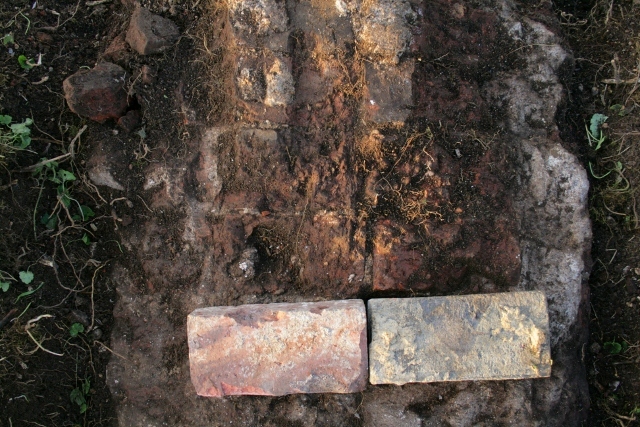 Looking SW from rubble mound at E side of cottage showing the base of the 19thc scullery’s copper, the internal house dividing wall, and the projecting base of the chimney of the 19thc kitchen. 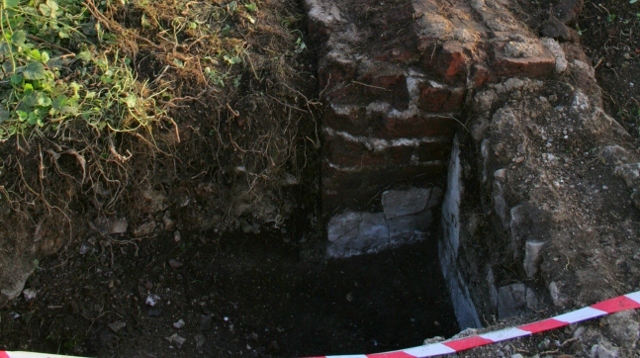 Its external width was 1.6m and projected out 0.65m from the inside edge of the cottage wall. In the 19th century, this room was used as the kitchen, all cooking would have been done here over the open fire. It may well have burnt coal, like most of Brighton at this time. 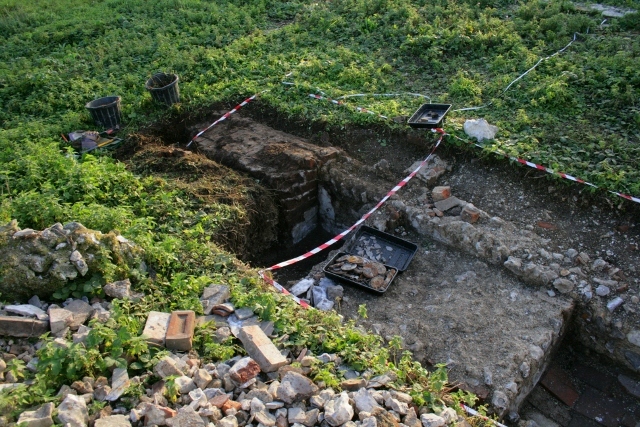 Immediately to its north the original ground level was 0.56m below the top of its surviving remains, buried in demolition rubble. Probable military WW2 finds of unknown function. 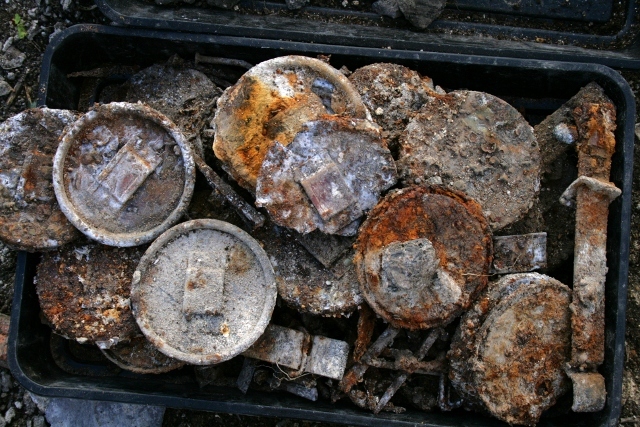 Towards the bottom of this fill exactly the same range of finds as those first discovered on Friday were observed; metal lids with fastenings on top for a strap to secure them in place; strange ‘bicycle bell’-like curved lids(?) with 3 holes (for ventilation? ); solid metal brackets with buckle fastenings at either end for a carrying handle but with no means of fixing them to the container they were probably intended to help carry other than the broken fragments of thin metal strapping which were plentiful supplied with holes for small metal nails/tacks. Ceramics and glass shards were hardly to be found. As previously recorded, the area showed many signs of burning – mostly ash and fire scorched and shattered flints, though this seemed to be localised. The evidence for the limited burning is the finding of (a very few) lumps of unburnt coal. and to the south, which is where we will look on Friday. We would love you to join us – no experience required! We meet at the car park near the junction of Bexhill Road and Falmer Road, just north of Woodingdean, at 10am, and if the weather is too bad to dig we are still happy to give a quick tour for anyone interested. Please don’t hesitate to give me a call for further info. Also, our official guided tour of the site is on Saturday 2nd November, with a second tour Sunday 3rd, same time and place as above.